International engineering consultancy Royal HaskoningDHV will collaborate with leading supplier of products, solutions and services for industrial process measurement and automation Endress+Hauser to have its instrumentation certified for the Nereda® technology. As part of the agreement, the companies will collaborate in research and development to further improve the applicability of Endress+Hauser instrumentation to Nereda-specific conditions. An agreement to this effect was signed between the two companies. As one of the Nereda preferred suppliers Endress+Hauser is working on a compact solution to make installation and handling of the installed analytical instruments more easy and comfortable. Royal HaskoningDHV will actively support this process by making available technical know-how, performance data and access to its Nereda research and development facilities. Royal HaskoningDHV is an independent international engineering and project management consultancy. Our more than 6,000 professionals operating across the world are guided by a common principle – to enhance society together. Since 1881 we have been working with public and private clients on projects that have improved living conditions for many people. We deliver future-proof solutions while at the same time addressing the challenges societies are facing in respect of cities, water, transport and industry. Working together with our clients, knowledge institutions, partners, stakeholders and communities, we are passionate and dedicated to continuously work towards a better future for all. For more information, visit www.royalhaskoningdhv.com. Endress+Hauser is a global leader in measurement instrumentation, services and solutions for industrial process engineering. The Group employs 13,000 personnel across the globe, generating net sales of more than 2.1 billion euros in 2015. With dedicated sales centers and a strong network of partners, Endress+Hauser guarantees competent worldwide support. Endress+Hauser provides sensors, instruments, systems and services for level, flow, pressure and temperature measurement as well as analytics and data acquisition. The company supports customers with automation engineering, logistics and IT services and solutions. Our products set standards in quality and technology. For more information, visit www.endress.com. Nereda is the biological wastewater treatment technology that purifies water based on bacteria growing into compact granules. 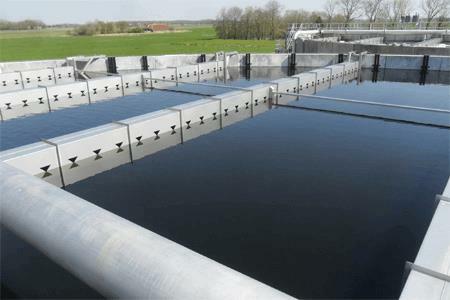 The technology was invented by the Delft University of Technology in the Netherlands and developed in a unique public-private partnership between the University, the Dutch Foundation for Applied Water Research (STOWA), the Dutch Water Authorities and Royal HaskoningDHV. Currently there are seventeen plants in operation and another fifteen under construction or design worldwide. For more information, visit www.royalhaskoningdhv.com/nereda.